Notes: Crocosmia is a genus in the Iridaceae family from tropical and eastern South Africa. 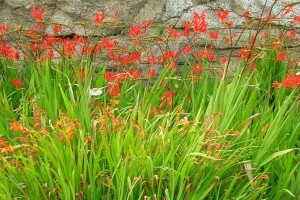 It is well known because of its frequently cultivated hybrid between Crocosmia pottsii and Crocosmia aurea, Crocosmia × crosmiiflora. 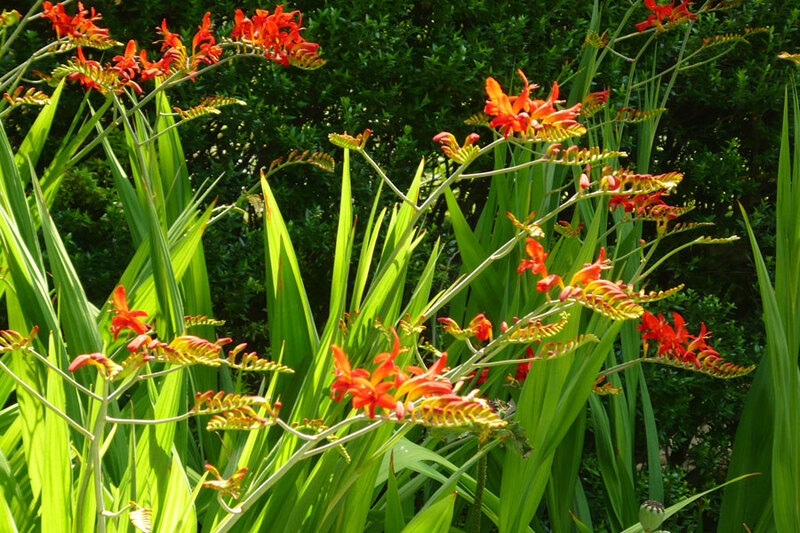 Plants have erect sword shaped leaved and spikes of tubular or funnel shaped orange to red flowers. 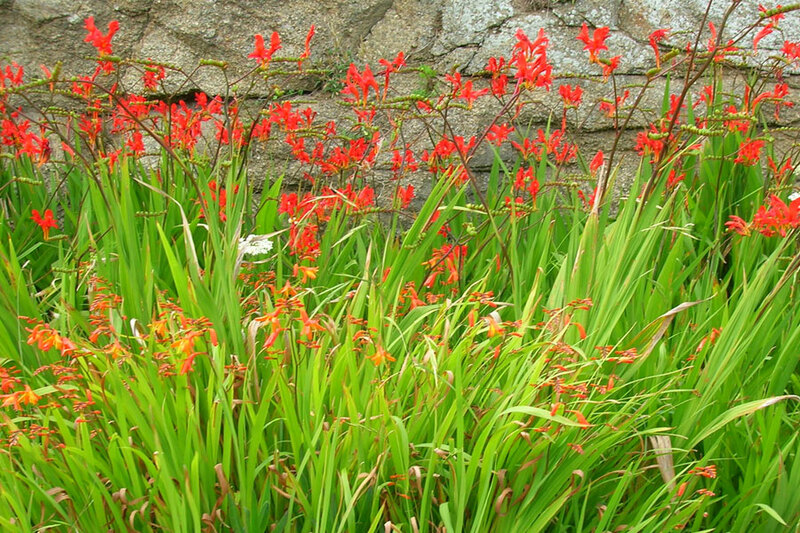 Crocosmias produce dense clumps of upright iris-like foliage. In midsummer this makes a good background for the small, profuse flowers. 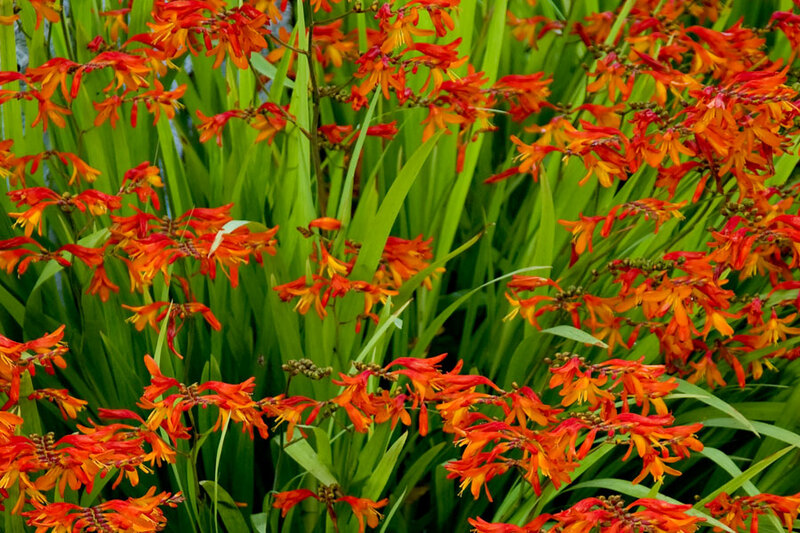 ‘Lucifer’ is an aptly-named variety because its flowers are the hottest coloured of all – a searing paprika red. The individual blooms are not as big as other crocosmias’, but small-flowered varieties such as this are the hardiest which makes them a wise choice in cold districts. 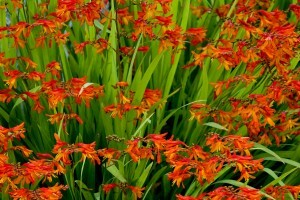 Grown in a flower border, they provide structure and colour. The Royal Horticultural Society has given it the Award of Garden Merit (AGM). Crocosmias are very beautiful, I wish I could fit them into my garden. It is unusual for shade loving plants to be so brightly colored. Thank you for telling us about it. So glad you approve Sage Butterfly! I can’t wait to plant them. Waiting patiently for my tree-guy to come and clear the dense shade. Hi Chris, I think this will be a fabulous addition to your garden. The colour is dramatic and the iris-like flowers are gorgeous. The shape and the drape of the leaves will really do well in the back area. Beautiful choice!! Hey!! Thats wonderful! Thanks a mill. Sorry for silence -just have my headspace filled with work stuff. Will post soon. My neighbor grows them and has been trying to get rid of them for years. I think they are pretty, but she finds them invasive. I’ve only seen this in pictures, until a few weeks ago I was surprised to see it in real life! It made my list, too. Lovely! It seems like the type of plant that would be perfect in a clustered corner. Thanks for the encouragement Hanni – I agree, the photos of them in groupings look wonderful. Love these! I’ve planted these so many times, and they never survive our winters. I don’t think it’s the cold temps, but too much water. Maybe I’ll see if I can find a well-draining location and give them a try again. I hope they work for you this time Alan … I’d be thrilled if you had a native South African flower flourishing in your garden. The species is a thug. I pull it out of beds by the handsful. It is a butterfly magnet, however, so I tolerate it. 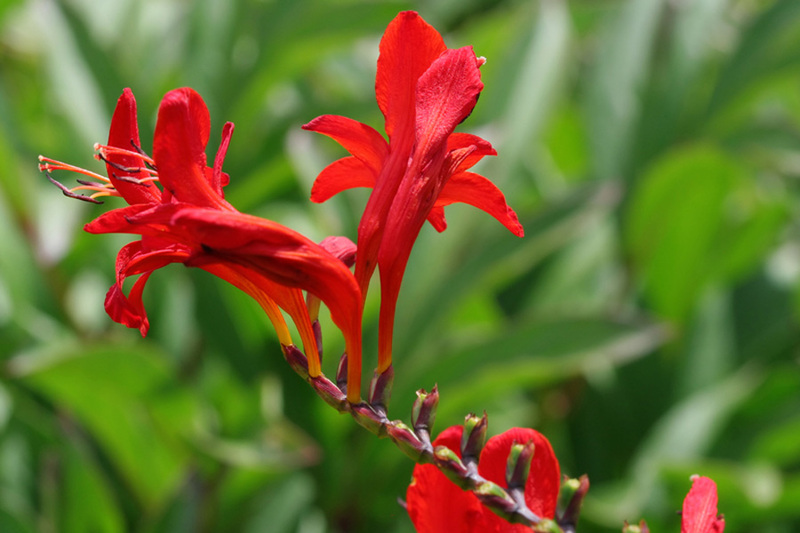 Beautiful flower…such a nice hue of red. And I love the tube shape as well.